If you’re looking for the ultimate in steel drum music, then look no further than RythmTrail. With over 20 years of experience from real Caribbean island natives, you can be sure your Beach Wedding, corporate event or special gathering is going to be a memorable event you and your guests will never forget. RythmTrail can turn your party or event into a special day by playing your favorite reggae, soca, calypso and steel drum favorites. RythmTrail can also custom create a playlist to introduce a speaker, create a romantic mood or to walk the bride and groom down the aisle. And whether you’re in Jacksonville Beach or you’re across the globe, you can be sure RythmTrail has got all of your events musical needs covered. RythmTrail can play your event or gathering anywhere in the country and internationally, so you can be sure you’re going to get the best steel drum music no matter where you host your event. Whether you need just one steel drum player or you need the entire band, RythmTrail is sure to make your event a special one to remember. So what are you waiting for? Get a free quote online or call us now at 866-495-4522 and bring your party to life with the soothing sounds of a Caribbean steel drum band. RythmTrail Steel Drum Band is Jacksonville’s source for the best steel drum music, calypso, reggae music, soca and island entertainment. From full size steel drum band to solo steel drum players / musicians, hire for any event in Jacksonville Florida. We hired the Steel Drum , 2 Piece Band , for our party . We had this party at our home and the band was early, set up efficiently, worked very hard and were enjoyed by all. They stood out for many reasons, but most of all for their willingness to move, move again, and again as the party was effected by thunderstorms and rain. They were very kind to our guests and we certainly would recommend them with enthusiasm and without reservation. We are also sure that we would want to hire them again. Thanks for making our event a success last night, my boss was very impressed with music and level at which you played. He was concerned about the volume and I assured him that we have booked a professional steel drum band, the best in the business. Thanks for showing up early and making the process stress fee as possible. I wanted to thank you again for doing such a great job in entertaining our guests at the Jacksonville grand opening this past Friday. I loved the way you guys played, and will surely be in touch for future openings. Please find my contact information below. our residents loved every second of listening (& dancing) to you!!!! You’ll be tired after another drive to Jacksonville tonight! YOUR ENTERTAINMENT WAS FAB-U-LUS WE LOOK FORWARD TO HEARING YOU AGAIN IN JACKSONVILLE. Ephraim, it was a pleasure to have RythmTrail for our event this weekend. The music was perfect as background or as performance. Dusty was so easy to work with, professional, and an excellent entertainer. We have contracted with Rythmtrail for the past three years and will continue to do so. Thank you for contributing to a fun evening. it fit right in with the theme. I would not hesitate to rehire again in the future. I was extremely pleased with Dusty and the entire experience of working with RythmTrail. You guys were easy to work with. Dusty was fabulous, prompt, kind and fit in like one of the family. Every one loved him. I am very happy to provide a testimonial. The drummer who performed for the fundraiser, “An Evening in Wine Country” which benefited the Boys & Girls Clubs of NE Florida was so awesome!! He arrived and set up early and performed a variety of amazing hits, sounding like a full band. Everyone enjoyed the music and even began dancing. There were compliments all around and I wished I had business cards because so many wanted to know how I found him. Definitely one of the best features of the evening. We will be calling on you again and again to provide the music for our events. Thank you so much and be in touch with me any time you want a recommendation! Hi again! Just wanted to reply to your request and let you know that our guests enjoyed the steel drum music very much this past weekend at our Marina luau! Dusty was on time, set up and started playing as guests arrived. He was also very cooperative and understanding when the weather turned bad – quickly – and we had to move him inside out of the rain! Luckily, many guests helped carry his equipment upstairs and he was set up (again!) and back to playing very quickly. He made sure to adjust the volume to accommodate the smaller indoor space, too. Overall, we are very pleased with our experience and the entertainment provided by Dusty of RythmTrail! 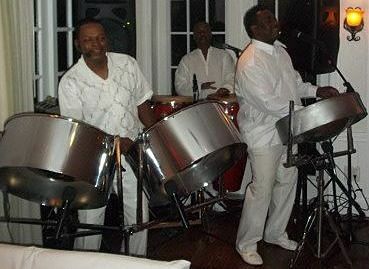 With over 300 bookings yearly and the best Caribbean entertainers RythmTrail is Florida’s most popular steel drum band. Our Steel Drum Players are all Authentic Caribbean Island Natives from Guyana, Jamaica, Trinidad & Tobago and others. Each with over 20 years experience on steel drums and Caribbean entertainment. We perform soca, calypso, reggae, Caribbean Christmas songs and more. Our Steel Drum Band sizes ranges from a solo steel drum player to a nine piece band or more. Whatever your entertainment needs are for any event we can customize a band size to fit your budget. RythmTrail Steel Drum Band gig update for events in Jacksonville FL and nearby cities. Another steel drum band performance tonight at the Jacksonville Zoo for the Christmas Lights event from 6-9 PM. The best steel drum music in Jacksonville Florida. Where are we playing today? Live steel drum music tonight at Aqua Grill in Ponte Vedra Beach FL for a wedding rehearsal dinner. Hire the best steel drum band & steel drum players for events in Ponte Vedra Beach. Our steel drum player will be jammin in Atlantic Beach FL today for a beach wedding ceremony and cocktail hour reception. RythmTrail steel drum band will be playing in Neptune Beach FL at Lemon Bar today for beach resources center 11th annual luau fundraiser event. Come out and enjoy the steel drum entertainment from the best steel drum player in Jacksonville FL area. Looking for a steel drum music in Ponte Vedra Beach FL area? RythmTrail Steel Drum Band will be playing at the Sawgrass Marriott Golf Resort & Spa today Mar 5 2016 for a Charity / Fundraiser Event. Book the best steel drum players for events in Ponte Vedra Beach and nearby cities. Where are we playing today? We are providing live steel drum music tonight for an anniversary event in Jacksonville Florida. The best steel drum players for birthday party, wedding reception, beach wedding, rehearsal dinner and more in Jacksonville FL and nearby cities. We will be jamming live steel drum music tonight at a private house party in Jacksonville FL. Book the best steel drum players for your wedding, party or corporate event in Jacksonville Florida.